These should be no problem for a Cisco ASA, even when it’s restricted by a base licence. Ideally the client should be buying a Security Plus licence to do this – but in this case it’s not strictly necessary so we decided to go ahead and configure the firewall without the additional cost. or some other combination of your choosing. But wait. In our case we don’t have a DMZ but have two Internet connections. So to get all 3 interfaces working we need to block between a pair of them. We don’t want to block traffic between the inside interface and either of the 2 Internet interfaces, which leaves us with one option and that is to block traffic between the two Internet interfaces. Even though the 5505 is getting a bit old and past it’s end of life, note that the same scenario applies for the newer Cisco ASA 5506-X units which have the same restriction when running on a base licence. Again, as mentioned above, this restriction is removed if you buy the Security Plus licence. For failover of the routing between the two ISPs we can use ordinary static IP routes with IP SLAs performing the monitoring and updating the metrics for the routes – this function on the ASA is very similar to that on Cisco IOS routers. So let’s get started by configuring the interfaces.
! interface Ethernet0/2 ! interface Ethernet0/3 ! interface Ethernet0/4 ! interface Ethernet0/5 ! interface Ethernet0/6 ! interface Ethernet0/7 ! interface Vlan1 nameif inside security-level 100 ip address 192.168.1.1 255.255.255.0 ! Note that we’re using the upper-six ethernet interfaces, all of which belong to VLAN 1, as the internal LAN interfaces.
! 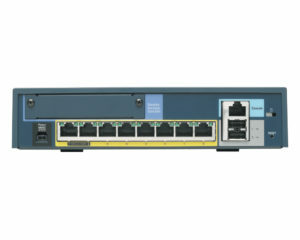 interface Ethernet0/1 switchport access vlan 3 ! interface Vlan3 description Internet ADSL PPPoE no forward interface Vlan2 nameif isp-1 security-level 0 pppoe client vpdn group PPPOE ip address pppoe setroute ! vpdn group PPPOE request dialout pppoe vpdn group PPPOE localname user@isp-1.domain vpdn group PPPOE ppp authentication pap ! vpdn username user@isp-1.domain password ***** ! Configure the login parameters as required by your ISP. Note that we’ve got ip address pppoe setroute set so that the PPPoE process will set the default route automatically to the gateway address that it receives from the PPPoE negotiation. At this stage, your Internet access should work fine via the PPPoE connection. Note that I haven’t included NAT and policy rules in this example.
! interface Ethernet0/0 switchport access vlan 2 ! 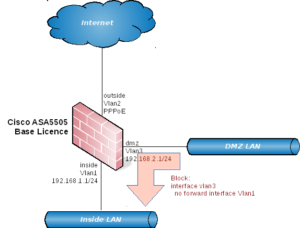 interface Vlan2 description Internet wired nameif outside security-level 0 ip address 2.2.2.1 255.255.255.0 ! This interface will be our preferred route for reaching the Internet, so I’ve called it outside in accordance with Cisco’s convention. At this stage, the interfaces should all be up and working – buit I haven’t configured the default route to go via the Ethernet and fall-back to the PPPoE connection. This is in the next section below.
! sla monitor 10 type echo protocol ipIcmpEcho 8.8.8.8 interface outside num-packets 3 timeout 500 frequency 3 ! sla monitor schedule 10 life forever start-time now !
! route outside 0.0.0.0 0.0.0.0 2.2.2.254 10 track 1 ! 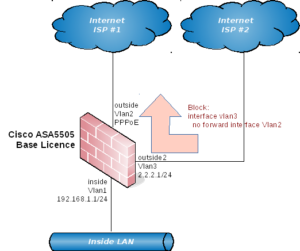 Set the correct gateway here that is required by your ISP.
! interface Vlan3 pppoe client route distance 20 ! Now we should be good to go. Time to verify that everything is configured OK, and then perform some tests. First, lets take a look at the routing table. Again, it’s looking great. The pings are working and therefore the default route via the ethernet is up. Fantastic! When the ethernet interface was shut down, all routing switched over to the PPPoE interface. It looks like we’re all done here (but don’t forget to no shut that interface before you pack up and go home). Do some more testing by accessing public web sites while disconnecting and re-connecting the ethernet interface. There should be about 30 seconds delay for the SLA monitor and trigger the fail-over when you disconnect it. When you connect it again, there should be very little delay. Note that because of the ASA’s state table, long-lived TCP connections will get disconnected during the failover and fail-back process. 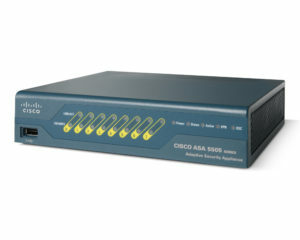 In conclusion it is quite possible for a Cisco ASA 5505, with a restricted base licence, to properly connect to two ISPs and fail-over between them. But note that if you do this then you won’t be able to add any other interfaces to your firewall such as an additional DMZ. So, if you’re desperate then yes, it can work as this example shows. Excellent , It really helped me to resolve my issue of configuring dual ISP on ASA 5505 with base license. Thank you so much.